Apple’s stock continued its big upward march today, closing at an all-time high price of $219, pushing Apple’s market capitalisation to $202 billion. When we last looked at Apple’s market cap in November, it was at $182 billion. At that time, rival Microsoft’s market cap was $261 billion. 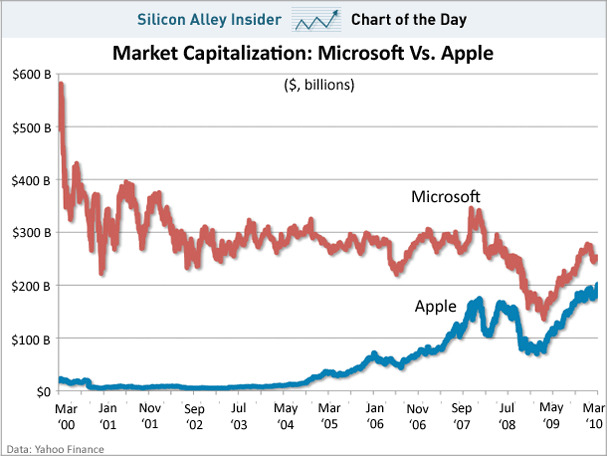 Today, Microsoft’s market cap is $253 billion. Unless Microsoft manages a miracle and produces an unprecedented run of amazing growth-driving products, the only question is when — not if — Apple’s market cap will surge ahead.